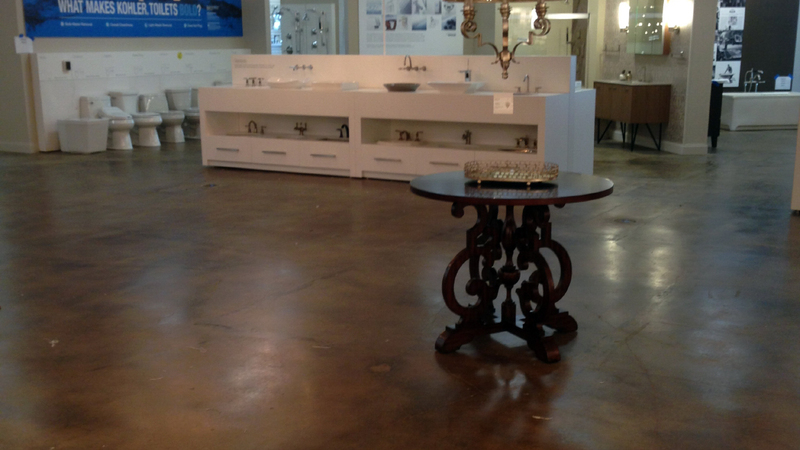 One of the most recent and important options in decorative concrete is diamond polished concrete. For many years when someone referred to polished concrete, they were talking about sheen or a sealer. Thanks to development of polishing equipment, you can start at a low grit and grind the floors down to expose the aggregate and smooth the surface. We pass over the floors with increasingly higher grit diamond pads (usually 9 different grits) until we achieve a natural sheen. We can stain during that polishing process so that we get a wider variety of color options. Currently gray colors are very popular ranging from the darkest charcoal, to medium tones, brownish gray, bluish gray and to the natural gray of the concrete. A concrete densifier is added to strengthen the floor. The beauty of diamond polish is that you have no sealer to scratch or scuff. People compare it to diamond polishing of a terrazzo floor or a granite countertop. The sheen is natural and not created by a sealer. It’s probably the most durable floor with the least amount of maintenance to concrete floors yet. Call us and let’s talk about your project.